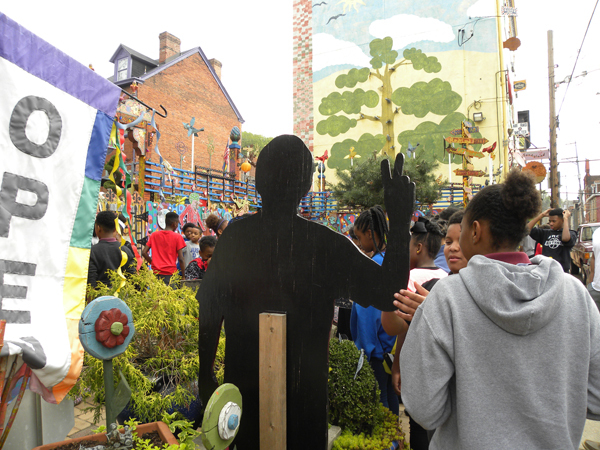 During a full-day program with PHLF on May 7, 2018, sixth-grade students from Manchester Academic Charter School explored several historic Northside places that have been adapted for new uses, and they also interviewed seven people who live and/or work on the Northside. SLB Radio recently produced audio-recordings based on those interviews. Click here to listen to the stories of seven people who live and work on the Northside: Amber Farr, Director of One Northside, The Buhl Foundation; Bill and Kim Gandy, Curators, Allegheny City Historical Gallery; Faith Miller, Human Resources Coordinator, Children’s Museum of Pittsburgh; JuWanda Thurmond, Human Resources & Volunteer Coordinator, Children’s Museum of Pittsburgh; Karamagi Rujumba, Director of Development & Communications, PHLF; Mace Porac, PHLF docent; and Mark Fatla, Executive Director, Northside Leadership Conference. Sixth-grade students from Manchester Academic Charter School interviewed these Northsiders during a special field trip and program PHLF planned for them on May 7, 2018, in cooperation with SLB Radio and the Children’s Museum of Pittsburgh. The students learned more about the history of the Northside and how it has changed over the years, in preparation for their move to their new middle school in the former Allegheny Regional Library in 2019. PHLF thanks the McSwigan Family Foundation for supporting its educational programs that help young people explore their community, develop a sense of pride and belonging, and become active citizens.